Coffee Lovers Rejoice: Parachute Coffee is coming to a Mailbox Near You! #parachutecoffee - Frugal Mom Eh! Coffee is part of the daily routine for many people and trust me when I say that I am no different. I look forward to sitting down with a hot cup of coffee every morning and then again once the kids are in bed. Sometimes I wake up super early just to get my coffee fix without having any little people jumping up on me. I love everything about coffee – the smell, the taste, that warm fuzzy feeling it gives you… the way coffee just makes you feel like you are at home no matter where you are. I was recently introduced to a new subscription service for Coffee-Loving North Americans that will be sure to mix up your daily coffee routine. 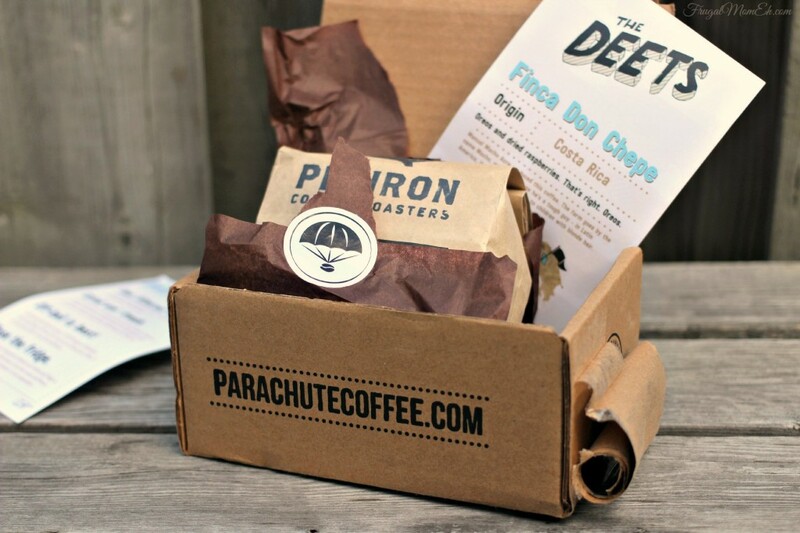 Parachute Coffee launched in April (2014) as Canada’s new monthly subscription delivery service for freshly roasted coffee. They have partnered with award-winning Canadian small-batch specialty coffee roasters to ship a different roaster every month to subscribers. 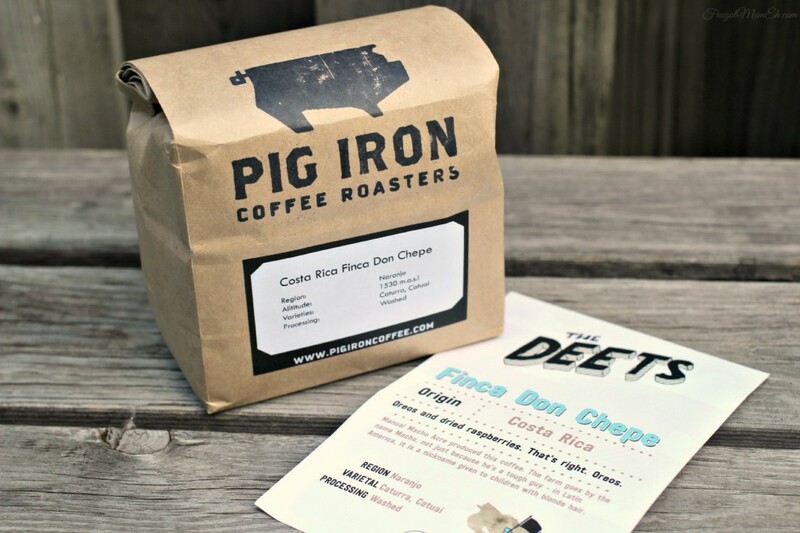 Septembers fresh pick is from Pig Iron Coffee Roasters based out of Mississauga (Ontario) with their Costa Rica Finca Don Chepe Blend. The tasting notes that accompanied the coffee shipment mention Oreos and dried Raspberries. That certainly caught my attention and I couldn’t wait to brew a cup, especially considering the amazing scent coming from that bag before I even opened it. 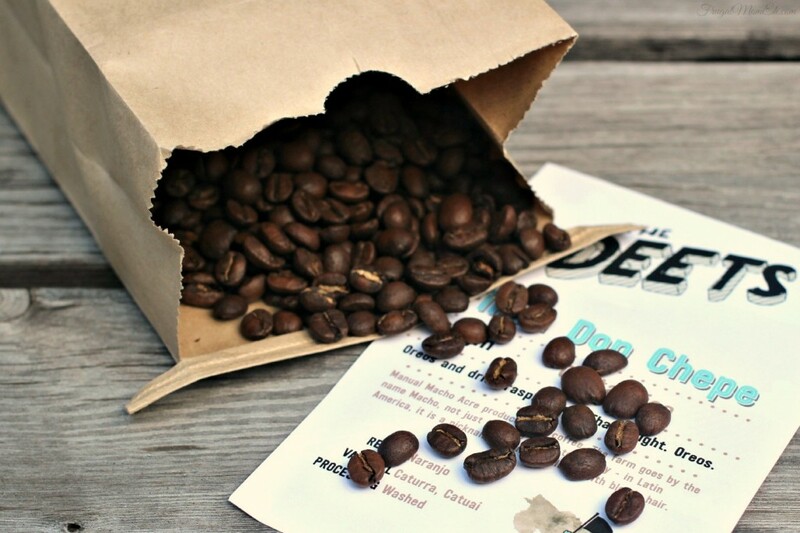 When I did open the bag, I was a little big shocked… because… it’s actual coffee beans! You will probably think this is a bit ridiculous but I’ve never encountered coffee beans that were not pre-ground. Pretty crazy for someone who considered themselves to be coffee obsessed. Never fear though, I brought out my Blendtec blender and had a cup of beans ground up in a matter of seconds. 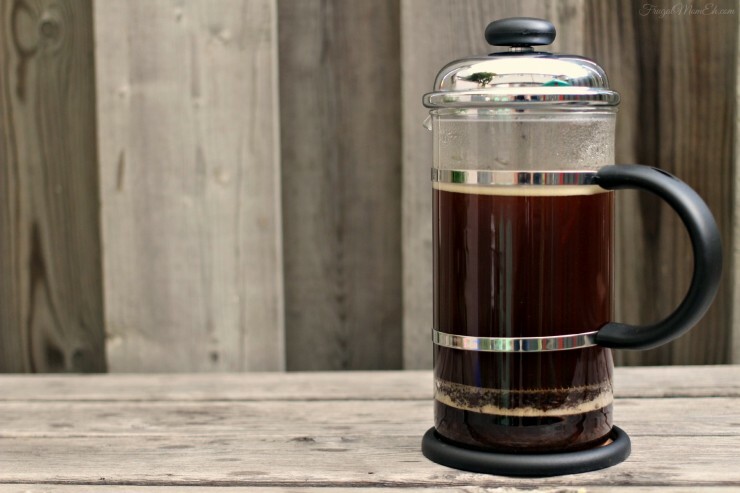 I also brewed it using my coffee press since I really did get rid of my coffee maker a couple months ago but also because it just brews better flavoured coffee in general. I was kind of blown away at the quality of flavour that I was able to extract from these carefully grown and roasted beans. I am talking a level of flavour that can be enjoyed easily without the addition of cream or sugar. It has really distinct fruity notes that makes this coffee taste naturally sweet. I was actually really surprised by the flavour. I’ve been drinking my coffee black for about 6 months now and mostly just kind of deal with bitter unflavoured coffee just because I love coffee so much. This is an incredibly pleasant tasting roast and if this is par for the course when it comes to craft coffee, well, I am sold on Parachute Coffee. The service is a fresh and convenient alternative to store-bought coffee, and a wonderful way for coffee lovers to be introduced to small-batch specialty coffee roasters. Kind of like a delicious dating service for coffee! For $25 a month (shipping/tax included), you will be sent a 12 ounce bag that isgood for 35-40 cups of coffee. This sounds steep, but I feel that it is fair considering the amount of coffee sent, the convenience factor plus the pure adventure of being introduced to Canadian Small-Batch Coffee Roasters you may not have had the opportunity to encounter otherwise. They also ship anywhere in North America. For more information about Parachute Coffee and this month’s roaster, you can visit their website at www.parachutecoffee.com or follow them – they’re brewin’ on Facebook, Instagram and Twitter. 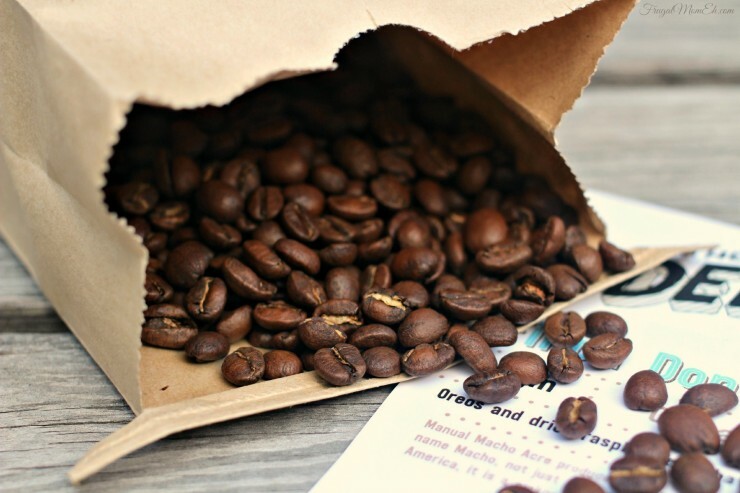 One Frugal Mom Eh reader will win one months subscription box shipment from Parachute Coffee (a a 12 ounce bag of roasted coffee). Giveaway is open to Canada/USA and ends on October 5th at 11:59 pm EST. See Giveaway Tools form for entry and T&C. It includes express shipping FOR FREE on every single box you order…great gift giving idea! Coffee roasters work really hard to create the perfect roast and once the beans are exposed tonair they start losing their flavour. Many craft brewers are starting to make coffee beers. I love the delicious recipes on their blog. I learned that coffee beans should be ground fresh each day. I liked the raspberry oreo coffee creamer!! I learned that some craft brewers are starting to make coffee beer! Crazy stuff. I love the raspberry oreo creamer recipe! I learned they offer express shipping! Learnt of another use of a mason jar with a tight lid – Keep your beans in a dry space, at room temperature, away from direct sunlight. This should keep your beans fresher, longer. I learned that coffee beans should be ground fresh for use each day. I loved the idea of making my own at home Frapp! Plus there are so many other recipes I can try now that the cooler months are fast approaching! I learned that they have recipes as well. The perfect cup of coffee is a noble and sometimes maddening pursuit. The At-Home Frappuccino sounds delicious and easy to make. there’s a lot in common between craft beers and artisanal roasted coffee..didnt know that .. I love the looks of that At-Home Frapuccino! Yummy! I love the craft brewers making coffee beer. YUM! free express shipping!? can’t go wrong there! there are a lot of good coffee recipes at parachutecoffee! I love the recipes…I need to try the Coco-frap one! I have never seen a recipe for Raspberry Oreo cookie Creamer ever! I didn’t know such a thing existed! So yes they must be really creative to have that recipe a long side their coffee products. I learned the importance of grinding the beans right before brewing. The similarities between craft beer and coffee! I LOVED seeing the frap recipe. Ive often wondered how to make my own and save 6.00 each time I crave one. I love that you can use your own, natural ingredients and not stuff that is mass produced for commercial businesses. The The At-Home Frappuccino recipe looks like something that my daughter would really like. I liked the recipe for the At-Home Frappuccino. Yum! who knew there could be so many recipes i love it! ty i love new sites! I like anything with Oreo notes in it! I would be more than happy to grind my coffee, knowing that it has no fillers or additives. I learned that many beer brewers are starting to craft beer coffee. Did you see the recipe for Raspberry Oreo Coffee Creamer…sounds yummy. I learned how to make frappuccino at home with their recipe! Free express shipping! Perfect… and necessary. craft brewers are starting to make coffee beers. I love that they feature a different local roaster each month! They are called coffee on wheels and they have craft beer coffee. I’m definitely going to try the recipe for At-Home Frappuccino! It’s a subscription service. How cool is that?! You get 12 ounces of coffee per month. I would love to try a coffee beer! I liked the advice on making cold coffee drinks! The recipe for coffee ice cream made from the freshly ground beans of Parachute Coffee and combined with toasted pecans and a caramel swirl sounds AMAZING!! I love the diversity of adding coffee RECIPES!AWESOME! Oh my gosh – the recipes! I can’t believe how great they sound. The coffee ice cream with toasted pecans and a caramel swirl is incredible. I learned that properly storing your beans can slow the aging process. I learned that they make some amazing coffee,they have a while selection.their site has great helpful hints.Thanks for sharing.can’t wait to own my own. The At-Home Frappuccino sounds amazing!!! I’m so glad they told us how to make that as I cannot wait to try it! I learned that most people make the mistake of grinding the bag all at once. I love the easy layout of recipes and how tos to make at home. Thanks for contest. I learned that they have some awesome recipes! How about that Coffee ice cream made from the freshly ground beans of Parachute Coffee and combined with toasted pecans and a caramel swirl? HEAVEN!! Their coffee is made in small batches like artisnal beer. I would love to try the COFFEE ICE CREAM WITH TOASTED PECANS AND A CARAMEL SWIRL recipe. It looks so good! Not only do I love the recipes the fact that there is free shipping makes it very appealing! I want to try the at home frappuccino. Love the recipes on the site going to try one out right now! I love the recipes that they provide. I LOVE that they include recipes,yum! I learned that you should grind your coffee as you use it and I love the Raspberry Oreo coffee creamer.I just love coffee! !..Thanks for this awesome opportunity to win and try some Parachute Coffee!!! I’ve bookmarked the Raspberry Oreo Coffee Creamer recipe! Sounds delish! Coffee ice cream made from the freshly ground beans of Parachute Coffee and combined with toasted pecans and a caramel swirl! I had not thought of making my own coffee ice cream but this sounds so good will have to try it. I learned you need to grind beans right before brewing. I love that they have various recipes listed that you can try and share. Parfois on commende sur internet et avec les frais d’ expéditions on reste surpris notre achat vient de faire un méchant bond, avec eux pas de frais d’expédition, un beau cadeau. Leur site est plein de recettes, une bonne idée pour utiliser le café autrement. they have alot of great recipes! Keeping the beans in a dry space, at room temperature, will preserve them longer. I learned that they have free shipping and that they ship from a different Canadian roaster each month. The Coffee and Raspberry Bread Pudding recipe definitely caught my eye. I liked the coffee beer. It seemed like a neat concept. Love the ice cream coffee idea yummy! Coffee beer definitely caught my attention !!! love the recipe for ice coffee cubes! I learned that you can put coffee beans in a sealed mason jar to keep them fresh! Beer coffee, oh my! and who would of thought to crush up coffee beans and add it to ice cream? Wow, love it! I was not aware that Canada had small batch coffee roasters that shipped across North America. I learned they have fun with photography! That artisnal roasted coffee is produced in small batches, and that no matter how well they make it we can ruin it. yes, i have a grinder. only way to have coffee, freshly ground. The COFFEE ICE CREAM WITH TOASTED PECANS AND A CARAMEL SWIRL sounds amazing! I learned that they ship 340g for $25/month. I would love to win this contest to find out if the coffee is worth it. I buy fresh roasted locally for $18/lb as a treat, I could be convinced. I learned that they ship 340g for $25/month. I would love to win this contest to find out if the coffee is worth it. I buy fresh roasted locally for $18/lb (355g) as a treat, I could be convinced. I love the recipes on the site. I learned that some craft brewers are starting to make coffee beer and I love the recipes they have posted. There are a lot of helpful how to’s on the site too, which is excellent for those new to coffee (crazy to think there are people who have never tried coffee!!). I love the coffee ice cream!! Love coffee! Always trying new brands of coffee; organic is the best. Great recipes! Best idea ever, pour your parachute coffee into ice cube tray and freeze! Why did I never think of that before! I learned all about storing and grinding your beans properly. I like how they feature different roasters each month. I really liked the COFFEE ICE CREAM WITH TOASTED PECANS AND A CARAMEL SWIRL. This sound rich and delicious. I love coffee, so I like the opportunity to try different blends. Looks fresh, too! I’m going to have to really peruse the Parachute Coffee blog. Just at a glance, I am in LOVE! I can’t wait to try the recipes for Raspberry Oreo Coffee Creamer and COFFEE ICE CREAM WITH TOASTED PECANS! I learned that this is a Canadian company. I like that they have recipes. There are great recipes on their site. Love the COFFEE ICE CREAM WITH TOASTED PECANS AND A CARAMEL SWIRL recipe. Gotta try it. I found that you could make amazing and delicious recipes, of all kinds, using Parachute Coffee. I liked all their lovely recipes using coffee! The recipe on the site for Raspberry Oreo Creamer sounds so yummy! The coffee ice cream recipe they have looks delicious! I like all their recipes. They look so yummy. That site is gorgeous! Loved looking at their at-home Frappuccino recipe! The raspberry Oreo creamer recipe sounds divine! I learned how easy it is to make a frappuccino at home. Learned that storing one’s coffee in a mason jar with a tight lid. I learned that roasted beans begin to lose flavor when exposed to the air. I like the tip for keeping coffee fresh. I love all the recipes they featured especially the one for Chicken with Mustard. The first thing I noticed when I went to the website was the Oreo Raspberry Coffee Creamer which sounds like something that I would love to try I love that they give you recipes and brewing tips and that it is delivered to your home. The coffee they ship is made in small batches and award winning! I have never heard of coffee beer before! I think the raspberry oreo coffee creamer would be great to try. Oh my, I have to try the coffee ice cream! It sounds beyond delectable. I like the recipes that are on the site! I learned that there is a recipe for Coffee and Raspberry Bread Pudding that sounds really good.